New York Autobrokers > Blog > Blog > Tips and Tricks > Get Your Vehicle Ready for Spring! Winter is over and spring is here, which means it’s time to get your car ready for the warmer weather. Winter can take a toll on your vehicle, which is why it’s important to perform some spring prep. Learn how to get your vehicle ready for spring by reading on. The first step to getting your vehicle ready for spring is washing the underbody. The underbody of your car, truck, or SUV can collect salt, sand, and debris that leads to corrosion. 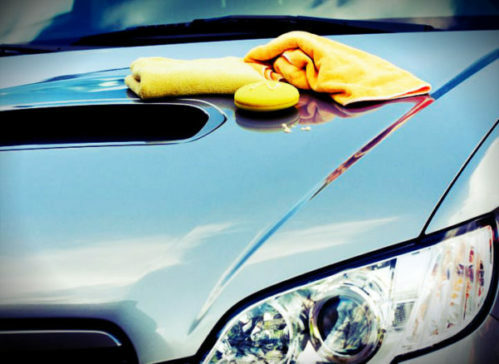 To protect your vehicle from rust and corrosion, be sure to wash the underbody this spring. Next, scrub your vehicle inside and out. Spring cleaning isn’t limited to your home. Clean the interior and exterior of your car to remove the salt and sand that has collected on your vehicle during the winter. While salt and sand can make roads safer to drive on during the winter, they can also damage your car’s paint. Thoroughly scrub your vehicle and use wax to finish it off. Replacing your wiper blades is an important step in getting your vehicle ready for the spring. Spring means rain, and you want your windshield wiper blades to work in the event of a storm. The changing temperatures can affect your vehicle’s tire pressure. To be sure your tires are properly inflated, check your tire pressure this spring. The correct tire pressure for your specific vehicle can be found on the driver’s side door and in your owner’s manual. Finally, top off your fluids if needed. In addition to windshield wiper fluid, you want your coolant, oil, brake fluid, and transmission fluid to be topped off. Searching for a car this spring? If so, stop by New York Autobrokers. Our location features a lot filled with vehicles, as well as a leasing and finance department that can help you get behind the wheel of your dream vehicle. New York Autobrokers is located in New York City, or you can reach us by phone at 631-446-4455.